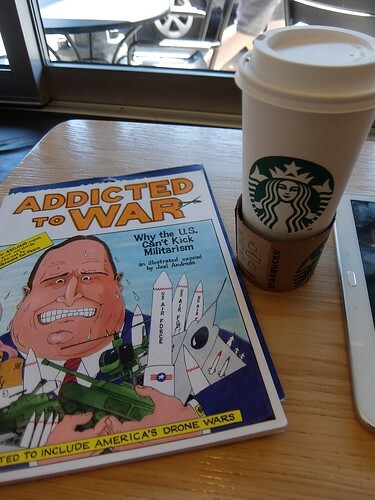 Addicted to War is not Logicomix, however I'd connect them, philosophically. Bertrand Russell was a pacifist. I linked to the latter graphic novel, out of Athens, from QuakerQuaker this evening. I carried Addicted to War around the neighborhood today, constructing photo ops and archiving the shots, helping WILPF re-circulate an old classic. Hawthorne is the site of the Linus Pauling House, Linus being a pacifist as well. That think tanks out here would be into such lampooning is hardly surprising. The zip code areas are not carbon copies of one another. ... found this looking for stop action studios for nat, cool! 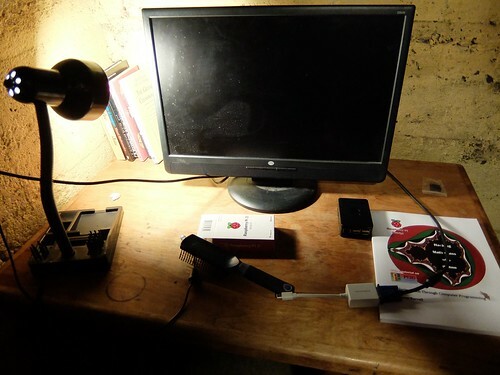 Getting POV-Ray to compile on my Raspberry Pi 3 took some doing. I don't consider myself an expert with this particular tool chain. Here's a reconstruction of the steps I took, though a lot more trial and error went on. Now that I have both Antiprism and POV-Ray on a Pi, I can "blow bubbles" such as the above. 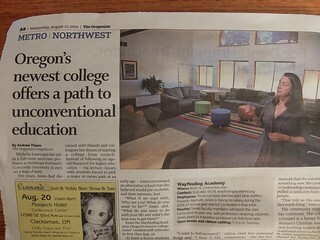 We're spreading this savvy to Oregon's schools. I'm also scheduled to address a middle school in Texas, about programming more generally. Got little @Raspberry_Pi to render https://t.co/CLBHYjHFtk shapes. 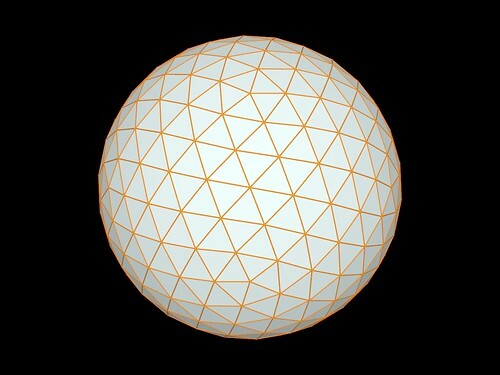 See shapes API at https://t.co/pNmZaH69pY - scroll down for renderings. I've come here with Carol many times, I've even worked here. I'm in the cafeteria on the ground floor. Carol needs to come back later this week as her measures are out of whack. She's lower energy as a result, but up for walking around the grocery store next. I've shared the Harold Kroto email with the Physics Learning list, an association of physics teachers concerned with best practices. Our discussions are free ranging. I'm not a physics teacher so much as an invited guest. Dr. Bob Fuller recommended me to this listserv. We're also yakking about what counts as "CS-friendly math" at the high school level (CS = computer science). Computer science and physics are both explicitly concerned with the time dimension, its advance. Mathematics has "pure forms" in the Platonic sense that don't change with time, a tetrahedron for example. In the Synergetics language we call these "pre-frequency" if drawing attention to the eternal aspects, the surface and central angles mostly. When it comes to vectors, as used on CAD (computer-aided design), 3D printing, these may be timeless. Once time enters the picture, it's a matter of computing a "next frame" and a "next frame" after that, as when making animations. Gerald de Jong, Karl Erickson, Russell Chu and a few others, were involved in early animations based on elastic vectors, meaning structural members that resisted further compression, or further stretching, according to various simple formulas. Gak! My next stop was the grocery store, top-level parking, where I discovered: no computer satchel on the back seat, with mom's walker. Oh yeah, I'd put that down next to the car, in the hospital parking garage. Oh God, I'd felt a bump backing out and idly wondered what that was. Putting two and two together, that was me driving over my own computer. Mentally, I'd gone through some of the process of not knowing many passwords. I rely on my computer to store them. I need to print out a hardcopy backup again, right away. I'd say WiFi is a tad iffy down here, even 4dsys1, but I'm getting signal, and work proceeds. We're having a heat wave and Lindsey strung up Christmas lights and left it uncluttered for the most part. She moved away quite awhile ago, divides her time twixt Oregon State University and the Kathmandu area. Thanks to getting the toilet fixed, there's nothing too out of whack, at least not in current weather conditions. You'd think I'd be using this space more, at least when it's hot. Well, here I am. I've been reconnecting with writings by Anthony Judge. We're not in a Vulcan mind meld or anything, just I enjoy catching up and recall when he analyzed the Bucky stuff sometimes. Speaking of which, I'm in a nomenclature clash with the "civil war" terminology being deployed right alongside maps that are clearly multi-state, if going by the old globes. I realize that nations come and go on this bubbling chaotic layer we call "civilization", and so the existence of variable lag times and "Doppler Effect" (as spun in Synergetics) makes plenty of sense. We don't all talk the same way, duh. In other words, sorry for sounding obtuse, when Turkey and a non-UN (unrecognized) state of Kurdistan, another unrecognized state, yet identified, and additional existing (recognized) states all overlap, of course it's a hodgepodge. But how is it a country at war with itself? People are still seeking some victory within the old framework, as if infrastructure depletion and "collateral damage" were worth some price for what future? Where was this all going? I'm tripping down memory lane, remembering how in Jersey City, after Princeton, I was writing in terms of a Housing Project and Language Project. It's not that I was planning to be "in command" of these projects i.e. I was not having fantasies of becoming a dictator, I just wanted a framework to think within, other than what had been handed me. 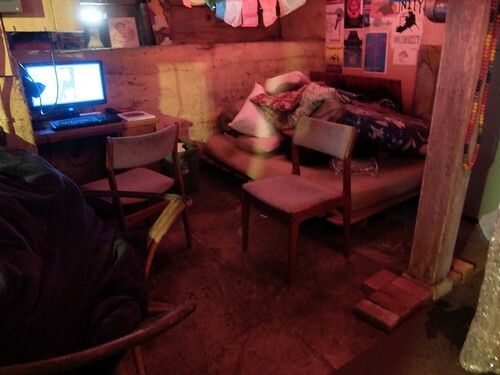 The Housing Project was a lot like "Orlando time share" but then came new life with AirBnB and like that. The housing stock would be shared more, with people sampling various lifestyles. "While I'm away, you can stay at my place" type deals. Some properties, such as the hotels along El Camino, come to seem like cultural institutions, meaning religious in origin (that's one way of putting it). The Language Project was like poster art. I drew a few of my own, simple pictures, like of the Earth from satellite / spaceship with captions like Game Park, and Spaceship. Wild Life. Nothing earthshaking. More recently I've come to Teaching Hospital as another good caption. Global U.
I was doing PR for the Bucky stuff in some ways, having picked up PR skills ("ad man" instincts) living in Rome, a cosmopolitan capital. Beyond that, I was simply aware that language was always changing, and we could "watch the wheels go 'round and 'round", like John Lennon did in his famous song. 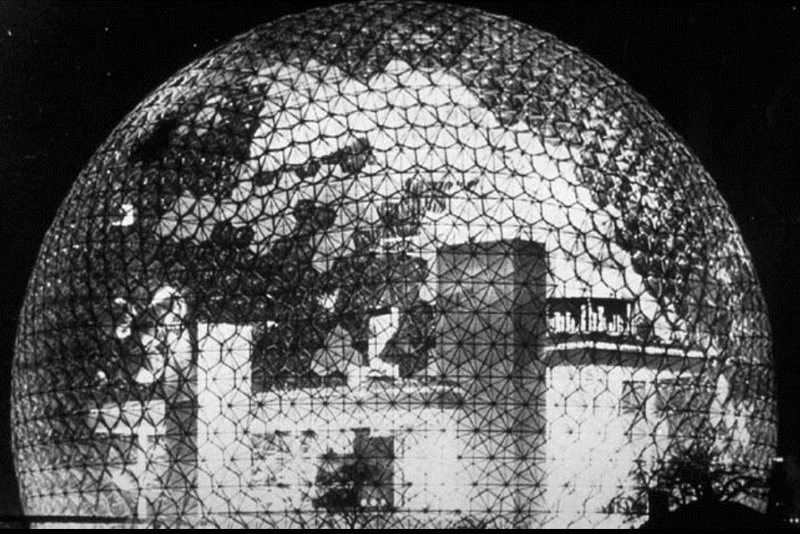 I'd go on to become the Buckminster Fuller Institute's first webmaster, though not for long. That I'd approach Language in this general way is predicted by my interest in Wittgenstein's philosophy, with background reading in psychoanalysis. Yes, I know, 8th grade is considered young for Freud but then prior generations didn't have Interpretation of Dreams on a high school library shelf. We did, at OSR. Language-oriented philosophy appeared to be getting into the same insights as the psychoanalytic generation, with Wittgenstein's bridging to anthropology somewhat completing the (Vienna) circle. I enjoyed the luxury of studying all this at Princeton (Class of 1980), getting a snapshot. I'll admit "civil war" keeps it sounding contained and that maybe soothes nerves. I'm all for soothing nerves. When the US was at it's own throat over what the future would be, people did not know the outcome and wondered what we would see, looking back (the back-looking vista keeps changing too, as we learn more). In the face of uncertainty and wonder about the future, sticking with a known vocabulary may be a choice in self defense. We don't jump ship until we have another ship to jump to, if we can help it. On the other hand, we need to protect the integrity of shared language in terms of meaning, as it's breakdowns in shared language that account for so much of the strife. The need to be truthful is also a requirement for traction. There's an urge to make sense. The opposite of "making sense" is maybe "fiddling while Rome burns" (to pick an already famous image). But with Rome already burning, what else was there to do? Might as well fiddle at that point. Anticipatorily nipping the causes of war in the bud was what George Fox was more into. Anticipatory Design Science. Looking ahead. Planning. Warring is the postponing of planning, which then has to be done anyway. 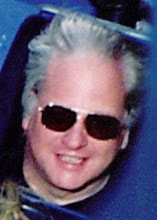 In other news, we tweeters (I've had my face in that) saw a dog in zero G, a samoyed Glenn guessed from my description. The dog appeared to be on the space station, which got my head spinning imagining the logistics, so I went browsing. I came to a source persuading me this dog was on a Vomit Comet. Yes in zero G, but not for a long time. 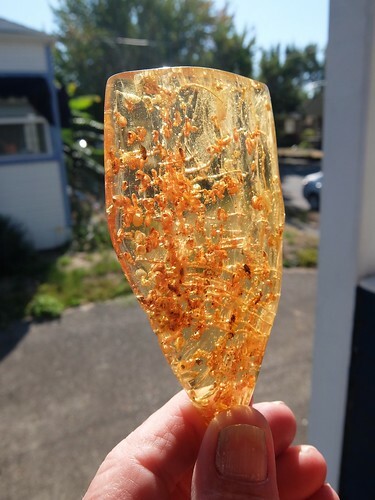 Glenn was by to show me some amber, the good Baltic kind with lots of bugs in it. I'm not just tweeting all day, however as a writer and code school teacher, math teacher and so on, I need to advertise that I'm out here and show off a portfolio. My "enough web dev to give traction" demo (a Flask application) has been time-consuming of late. I'm hard at work in my "studio" in other words, or PWS (personal workspace) in General Systems Theory (my blend at least). I got an ESL teacher on the phone in Florida, working a second job as a licensed insurance agent. We were discussing my plan options. He called just a few seconds after I filled out some POSTing web form, giving my age and weight. I'm not the big expert either but pulled the plug during verification, when I realized there was no reimbursement to medical providers, simply advocacy up front, negotiated fees for service, which I'd need to pay. "No cap" sounds good, until you realize they mean "on your expenses". The information was going by too fast. We oldsters actually do need time to catch up, if coming in from the sidelines. One needs orientation, meaning Youtubes. How about have some government officials actually explain what to do and how it works. Don't leave it to some "private sector" even if the latter has a role. The rules seem ever changing. Trying to make a sale and explain the New World Order in a single sales call is asking a lot of these sales folks. I got to talk to the supervisor later. He understood where I was coming from, but then the higher priced options had no real benefits unless I needed chemo or whatever. Can we hedge against such an eventuality affordably, per actuarial statistics? Apparently not? Not in the USA that is. I'm not talking about Dubai at the moment (what's a health plan like there I wonder?). Go look for Obamacare on the Web, and say "welcome to Shark World" under your breath, This is the USA they're selling today as "numero uno" in terms of great places to live. However, if shopping for a new country to join, be forewarned. They're somewhat in disarray in this fish tank. But then when have we ever really figured it out? Look at history. There's a difference between the process of planning, and selling plans. Plans need to be made before they're salable. I suppose that's obvious. 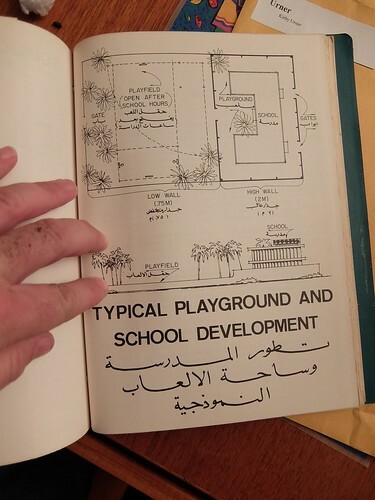 My dad helped plan for the Tripoli of the 1980s, from the standpoint of the 1960s. The plans were followed, or so we heard. Maybe "wellness plans" are indeed the coming wave, or is that how it's always been or whatever. So I Googled on "wellness plans" -- it was mostly about caring for pets. The plan provider even looked up my doctor's name. He was very personable. However it takes more than one visit to Best Buy to figure out about computers. Health plans are no less dense with information. Having companies ravenous to hook a new customer without allowing said customer to engage in a thought process, is not going to work out in the long run, unless the libraries get really good at simply imparting practical information. Has that been happening when my back was turned? Should libraries turn into call centers, or add call centers to what they do? I'd answer calls about specific topics. I'm not some know-it-all about everything (not a "walking encyclopedia" -- I could never win at Jeopardy). There's no one "go to librarian" who knows it all, plus they don't all speak Vietnamese, if that's called for. The dream of a World Wide Web (or World Around Web if thinking globally) close matches this idea of a "library", staffed with real people, not just bots reading scripts. The responses come asynchronously mostly, not instantaneously over the phone. At least that's true in my experience. An older guy like me, in good health (not on meds) in his late 50s, is able to get in on a wellness plan, but major medical maybe not, unless through an employer. DWA (our mid-life partnership) was a self employing "gig economy" type player (lots of clients, per resume, and my wife had as many), so that meant paying for our own coverage, which she ended up needing, for chemotherapy. There was something called Obamacare in the picture, but this was never really explained. Where's the web page again, to enroll? They say the deadline has already passed. But I was covered before, thanks to a California employer, so how was I supposed to jump ship? When people clamor for "single payer" I think that means a system they understand. I'm one of those guinea pigs in the system with an out-of-date picture of how "medical coverage" (the game) is currently played. There's probably a whole TV channel devoted to the subject, or a Youtube channel. No doubt you'll find a gazillion blogs chattering about these topics. Grain of Sand readers probably aren't coming here to find out about health insurance. They auto-call you now, when you fill in a web form and click, almost immediately. The calls are scripted and recorded. I bet a lot of people fail in verification, like I did, when I realized I didn't yet know the language and backed out. They say "hold your questions until the end" as they're hoping to get you to sign on some dotted line. But sometimes the sales process is so lightning fast you have no idea what you're buying, if anything. A description of the benefits will be mailed to you latter. Yes, all in English on the face of it, but what does that tell you? That we're in some play by Shakespeare? ESL == "English as a Second Language". 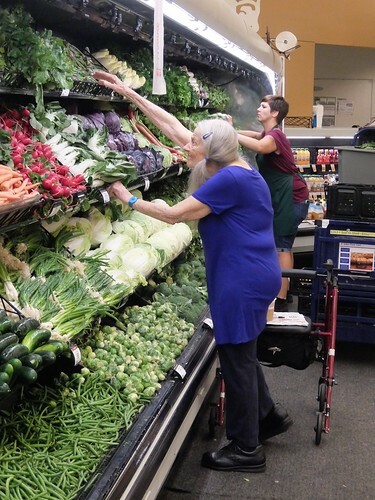 Carol (WILPF elder, 87) is up for Fred Meyer's by car. She and I missed the John Taylor talk at Thirsters. She's not as strong sometimes. Yep, we made it. The "two teachers per classroom" movement is addressing itself to the student:teacher ratio issue in a way that requires less floor space. We may still cram 30-40 students into the room, but we have two teachers in charge. In practice, the teachers do not always co-present. In a lab setting, both might walk around to the stations, helping individuals and teams. Or one teacher goes to code school, if a STEM teacher, or even an English teacher brushing up on grammar and typography, fonts and the like i.e. HTML + CSS. Then they switch and the other teacher gets PD (professional development). However, we've learned from sportscasting that two engaged in banter, repartee, dialog, may be far more enlightening than a lecture format. Have two geeks chattering, with an eye towards inclusivity, having students chime in, and you have a new model for bootstrapping into fluency, as a beneficiary of this "sportscaster" format. I also like the "talk show host interview" format and plan to use that more in my classrooms. I do both "brick and mortar" and "virtual" appearances. For years, my mode was asynchronous, meaning student work would queue and I'd "slay the queue" (evaluate submissions), either marking them "done" or "in need of more work". That was our "grading system": you keep chipping away until the mentor says it's OK, and is able to back up those decisions with reference to specific criteria i.e. it's not just subjective BS. This was Python programming; I'm not saying every discipline is able to communicate itself so much in this way. More recently, my mode is "radio show broadcaster" in a closed circuit television type environment. We have about twenty or so students, able to ask questions in real time. 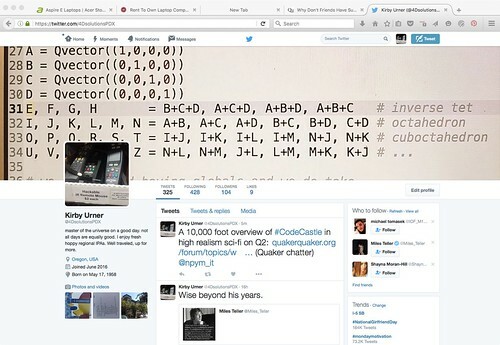 Mostly they see a talking head (mine) in a window, with my desktop filling their window or screen. I give them lots of privacy and don't turn on their cameras unless they're asking to be put on. I've been looking forward to such classrooms, so I'm not complaining now that I'm getting the opportunity to use them. Deke the Geek just left a copy of The Oregonian, Metro Section, in my box. I'll be going through that this morning, as the focus is on education this time. I was on the front page of the Metro Section once, in the 1980s, holding a Fuller Projection on a post card. Another time they featured me as a local futurist. I was anticipating "hypertext kiosks" in local hospitals, where people could browse about insurance plans. Sure enough, within some years, Providence Health System had precisely that. HP4E is a long-running campaign: "hexapents for everyone" is what it means. A role model campaign was Guido van Rossum's CP4E, or "computer programming for everyone". The latter had DARPA funding for long enough to get Tkinter + IDLE out the door, which popularized Python among Windows fans, one of the largest user bases in the 1990s. You'll find the gamer community, around Civilization especially, were hip to the idea of a "macroscope" (globe) divided into, not trapezoidal, not quadrilateral, but hexagonal, and a few pentagonal tiles. That's a "look". If you're into fashion, you know about "looks". The hexagon goes well with carbon chemistry. Why? Graphene. Nanotubes. Buckyballs. It was very nice to meet up again and remember our discussions at Masada I shall send you a copy of our MS on Ne22 in carbonaceous chondrites as soon as I have refined the first draft and also make any useful comments (should I have them) on your MS on He@C60 as soon as I can. in special copy of Graphis magazine, devoted to Expo67, had made a very strong memorable impression in my mind. I had suggested that we withdraw a book by BF from the Rice library which Smalley did. I was a visitor and had no library credentials. There are very few images of the simple truncated icosahedral (soccerball) structure in the book though there is one and BF is actually standing in it. At the time I was quietly satisfied that the –ene ending worked so perfectly from a chemical point of view and furthermore the name, though rather long, scanned very nicely...doubly satisfying. In the Ed Applewhite article http://www.4dsolutions.net/synergetica/eja1.html (extract attached) Smalley corroborates the fact that I gave C60 this name...a name that Smalley really did not like at all as is also indicated in the Applewhite article. I hope this answers your question satisfactorily! Not the most familiar way, considered obscure, but with some nice features. World maps as a math application: we get GIS / GPS in the mix early in Quaker schools. https://t.co/qvfhzZDsnJ (but in other schools too). Remember, Church of TI is Oregon's State religion, when it comes to what thou shalt bring to math class and AP exams. Practice kneeling and pretending to fit in. A friendly church may be offering free WiFi to the huddled masses, check phone poles for info. Curious about Verboten Math? It's a meme in these blogs. So what are Quadray Coordinates? Not just for private Quaker schools. Very like XYZ but no need for negative numbers in point addresses. Although like many US Americans, I have a credit card that accrues Frequent Flyer miles, I am not a frequent flyer these days. I've flown a lot in my day, over a period of decades, so it's not like I'm a noob in that namespace. I've been in London, Vilnius and St. Louis in the last decade or so, also Georgetown (2012). Nevertheless, I only got the Delta story, about computers going out, through Twitter, in a Portland neighborhood, land-lubbering in a drizzly setting. Yes, August rains. I wasn't in transit at the time, not even by bus (that would come later in the day). Yes, I remember another story, about a T1 or other data line getting cut, and that shutting down a service, I should Google that. An airline is a huge operation. I used to study airport management for entertainment, in a trailer park (mobile home estates) in Florida (Bradenton). Airport management is but a tip of the iceberg. I said "it's not my business, I'll gladly take in opinions and maybe in a hundred years venture to say something". Not so Patrick's crew, off by airplane this morning. Patrick has put in a lot of miles. He came by with some leftover Ja Civa's cake, which I may never have tried. That's a respected neighborhood bakery we're all proud of. When I teach object-oriented programming in Python, I'll suggest Concourse, or maybe LuggageSystem as a class name, suggesting they conceptualize an airport in terms of components, for software modeling purposes. Patrick thought in the EU that airlines were less lax because the administration was less prone to spoil the enterprises and let them get away with too much unskilled management. These were broad brush stroke considerations on Patrick's part, regarding matters we have only a metaphysical (psychological) understanding of. AI isn't really a big help right now, though search and pattern recognition certainly are. What's in vogue right now is seeing if we can dump vast amounts of big data through neural nets and get the AI bots to tell us what to do. However the GIGO principle still rules. MEMEX, a meme lobbed from the past by one Vannevar Bush in 1945, was on the money, hit the bulls eye pretty closely. Good aim. That's Google search, and like that. We absolutely benefit from the ease of retrieval, relative to having a duplicated library of books with ladders and so on, with an entire estate built to maintain it. We call those "server farms" today, and get the http responses back electronically, in milliseconds, by tcp/ip packet. I asked if the EU business climate was the reason for Brexit, that the UK wished for a more relaxed business climate as maybe people perceive in the US. Thanks to tort reform, this has become the new place to get rich quick, goes the hype, maybe. My thinking had turned to "tort reform" as a movement, given my recently viewing Hot Coffee, a documentary focused on that topic. Hasn't McDonald's had PR problems in the UK as well? That's a tangential question. For those just joining us, Google only recently became a subsidiary of Alphabet, in a reorganization designed to compartmentalize operations, reserving Google for search (which includes searching Google Earth, a big data operation). Speaking of search, we had an interesting discussion of correlation and signal composition, by algorithm, at the code school last night. A double-E gave the talk, I came late by urban train. This 2011 film got some additional attention in retrospect thanks to Jamie Leigh Jones finally getting her day in court (spoiler alert, stop reading if you don't want to know the ruling). However hers is but one of many cases discussed, and win or lose, the point is the integrity of the jury trial system. Pointing out that the US Chamber of Commerce is no more than a glorified lobby, is helpful, same with the Federal Reserve in a way (not mentioned in the Constitution -- anyone can use the word "Federal"). But then so are the DNC and RNC glorified lobbies, entirely dispensable to the US style of government, if going by original blueprints. Hundreds of parties would be just as feasible. What the Founding Fathers designed, was three branches of government providing checks and balances, with the Legislature and Executive branches supposedly controllable by money. The Supreme Court, on the other hand, cannot be wined and dined. 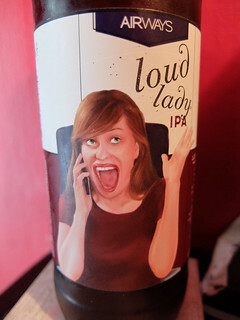 However that premise is somewhat undermined by the later discovery that state judge elections are in fact buyable. TV ads are quite persuasive when viewers are trained to stay uncritical by high school teachers. Karl Rove was able to lead a gang of business-minded Texans to buy what was legally for sale. The US Chamber of Commerce was pretty happy about the Reagan-Bush Era and the resulting change in climate. Today we see Congress able to block any Executive appointments to the Supreme Court, irreparably harming the system, tearing it down. Giving ordinary people access to the court system was proving inconvenient for business, as juries would empathize with people and seek to find just solutions. Just $800 for third degree burns thanks to inhumane kitchen practices was not sitting right with the people. By branding citizen lawsuits as frivolous, simply a "get rich quick" scheme by trial lawyers, the businesses, including doctors, would enjoy greater impunity than mere limited liability status provides. Profitability could be protected also, by means of caps on awards, with insurance premiums still rising or held constant. Likewise employees could be made to bargain away any right to court access by mandatory binding arbitration agreements as a condition of employment. Without a growing body of case law, with decisions locked away in silos, the paralysis of the justice system became complete. Loss of access to the courts is what happened to Jamie Leigh Jones, who was sent off to enjoy opportunities in Iraq only to find herself an easy target for a predatory coworker. The perp knew he'd get off if it ever came down to "he said versus she said", which it did, finally. He was right, though she had to go through hell and high water to find that out. With these new measures in place, the US as a system continued to crumble. The date of its official demise will remain debatable. Sometime around 1983? The executive branch had been turned into an instrument of Empire by the Halliburtons of the world. US Americans could now be exiled to overseas bases, turned into refugees, while investors, eager to play a "supporting role" could reap the profits from their exploitation. Many young people died for their president. Congress had proved too spineless to protect its people (Al Franken and Al Gore notwithstanding). Now the judicial branch was hollowed out. Al Franken is a star in this film for his brilliant maneuver: anyone doing business with the Pentagon at least, would not be allowed the customary "cowardly capitalist" outs. KBR had no choice but to allow a trial, which it won. Most citizens are losers though, and the US continues to enforce Prohibition without their consent. Even the bankers are getting mad. Continuing to pretend it's the dark ages just adds to the sense that we're done with our legal system, and something else is taking its place. I expect BDS (boycott, divestment, sanctions) to trump the award caps etc., along with more systems like Yelp for doctors. People will find out which companies played a "supporting role" in vicious land and oil grabs, human trafficking, other malpractice, and simply refuse to reward them economically going forward. I know I'll never buy BP again, if I can possibly avoid it. Given the agrarian origins of the one room schoolhouse, which gave Johnny summers off, to work in the fields, the curriculum was designed to be repetitive. Johnny would forget much of what he'd learned over the summer. Some review would be in order, come fall. Around 8th or 9th grade, come Algebra, Johnny and Jill would learn about "functions", math objects one calls with arguments, getting something back. Or maybe they just pair inputs with outputs. During the New Math era, formal definitions were provided. Functions need not be numeric. Along with functions, comes their composition. Given functions f and g, Johnny learns to write f(g(x)) and g(f(x)), but it all seems a tad meaningless and questions may be raised, by this or that student, regarding when these concepts will actually be used. In the meantime, everything that happens on an industrial scale, tends to happen because of software, because of code. In learning to code, we learn about functions too, and their composition. One pipes to the next. Functions are chained together. In the Python computer language, decorators are all about composition of functions. 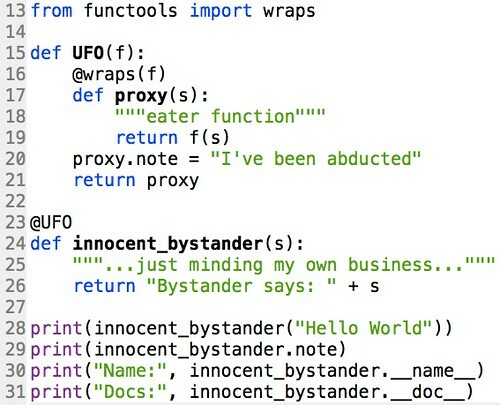 In the code below, from tonight's code school class, UFO "abducts" (composes with) innocent_bystander to return a well-disguised proxy, identical with the original right down to its docstring. I use the ABC TV show Invasion as a stage-setter, for story, with no requirement that students watch it. The plot is clear enough: extraterrestrials in the lake eat and replace innocent humans with identical clones, so outwardly the same, that even the clones themselves do not suspect they're but proxies of their original selves. The @wraps decorator completes the disguise, carrying the __doc__ and __name__ attributes from the original to the proxy function. The cloning operation is complete. Now that high schools are under some pressure to include coding, the question is: in what sort of course? The common assumption seems to be that any programming homework would logically fall under computer science, not mathematics, which is immune from needing computers, because well equipped with calculators. Math students calculate. Computer science students compute. That difference is enough to drive a wedge through a school and unnecessarily multiply the number of times the same content is covered. In math, Johnny learns to calculate with vectors. In computer science, he learns to compute with them. So on the one hand, we have mathematics looking for ways to prove relevance, and on the other, a discipline of proven relevance that's kept distinct from math, despite hitting a lot of the same topics. Both math and computer science involve functions, plotting, algorithms, data structures, tabulation, summation. However the assumption is math teachers cannot be retrained in place to add coding, because that's not what the textbooks include. Innovation, original curriculum-writing, as a part of the math teacher's job description, seems too much of a stretch, despite teachers wishing to actually teach, and thereby regain higher status. So not only is Jill given summers to forget, with repetitious fall reviews, but she's subjected to two separate approaches to a lot of the same material. Composition of functions is taught in math class, without much context, whereas computer science involves passing functions to functions that return functions. But we won't call that math. Computer languages have the ability to take the drudgery out of repetitive computations, freeing the programmer to focus on the logic, the algorithms. 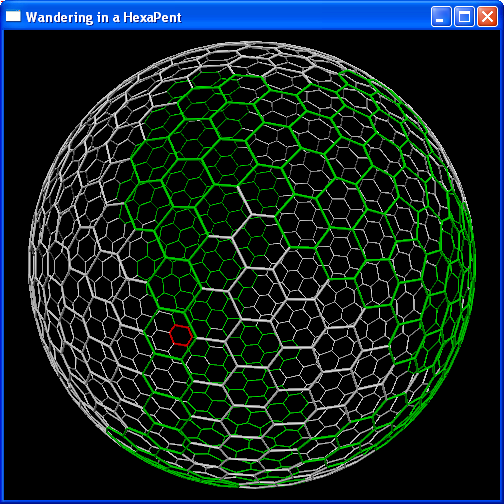 Rotating a polyhedron by applying the same rotation matrix to all its radial corner vectors, is tedious by hand, whereas once coded, happens at thirty frames a second or more. Are polyhedrons and their scaling, rotations, translations, part of math or computer science? Will students learn about polyhedrons from two sets of textbooks? Not only are Johnny and Jill subjected to yearly repetition and review, but the very same topics get covered within two different treatments. Given all the unnecessary redundancy and repetition in the curriculum, accelerator programs have many ways to provide a head start and speed things up. If we don't assume students are forgetting and starting over every year, plus learning the same concepts twice through two different treatments, we may be in position to at least double the curriculum's effectiveness. What will serve Jill and Johnny well over the years are keyboarding classes. Coding is here to stay, at least for a good while, and it's primarily a keyboard activity, not a drag and drop graphical activity, Scratch notwithstanding. Typing remains an important skill across the board. This interview is of historical interest in my view. [October 20: swapped a different one in, from around the same time, as the original link went to a canceled account]. Wikileaks is a grown up reader-funded public institution, tied to Ecuador, appreciated by the RNC (or at least the Trump campaign) for its revelations about election rigging. TV journalists consult Julian not as a man on the run, but as a CEO of something. More like Snowden. I'm not saying that's wrong. I appreciate hearing the views of both from time to time. The "Youtube broadcasting system" (shades of EBN) has helped level the playing field.